Roast chicken and roast pig (lechon) are both popular that introduction won’t be welcomed with surprise. We’ve been roasting these animals for, I don’t know exactly, forever? They are everywhere, scattered in all the corners of the world. Then there are processed crocodile meat nicely packed in plastics at supermarkets. Some people prefer to fried them, add them in a bowl of soup, or simply include them in burgers. Crocodile meat is exceptionally tender juicy meat. It’s rich in protein and good for people who don’t want cholesterol nesting in their body. Yeah, I got that. It’s not new either. I never heard this until today. Bangkok Post reported that a man in Lamphun that goes by the name Natthaphak who owns a restaurant, is also raising crocodiles in his own farm and decided to add the delicacy to his menu. 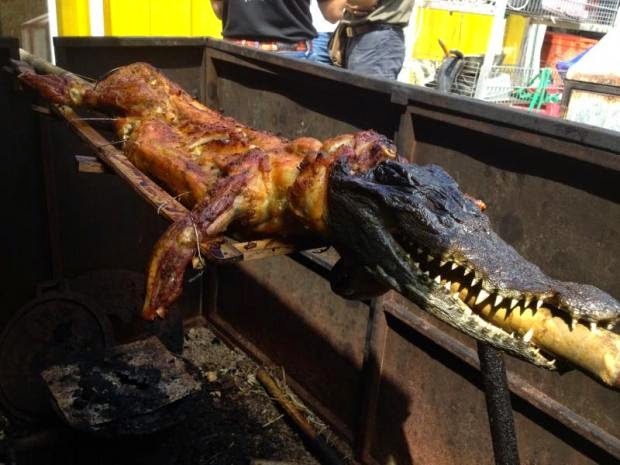 He thought that serving roast whole crocodile would be interesting and tasty since the demand for their meat increased in years. Added to that is the cost effective way of raising them. He just simply needs to keep the left over parts of the already popular ones such as calves and hogs, and feed the long snout reptiles once a day. It’s a win-win situation for him. A roast whole crocodile goes for 1,800 baht, a discounted price which he is offering only during the launch of this new menu. For the customers who want to taste the head of the roast crocodile as well, they have to pay 300 baht extra, he added. So, is Mr. Natthaphak expecting you soon?